I promised a look at the challenges we faced in the evolving local advertising space since 2005. So here it is, I hope this helps avoid similar pitfalls and help accelerate faster evolution from the advertising platforms toward a lower friction, more mature ecosystem of direct exchange. The traditional network model doesn't have enough local efficiency built into the system to scale geographically. Meaning that as networks sell to advertisers and attempt to match them to a publisher network, very few of those ads carry any location at all. Those that offer "local" targeting have meant city and in some cases zipcode which is fine for tests but doesn't warrant a premium for location. Current reality is different from current perception that; 1. advertising is currently location-targeted, (even location-aware), 2. there is advertiser demand for lat/long level targeting and 3. there are flexible mechanisms in place to sprinkle these ads around the web or to mobile devices. When Platial launched, the location-based advertising ecosystem was immature. We had the technical capacity to target by lat/long AND context but there were few ways for advertisers to buy these ad units. Additionally, it was difficult to define the value, so what will be a premium in 2010/2011 was experimental (read-free or cheap) previously. How much can you charge for location-targeting when there are no case studies for driving traffic to point of sale? One test of location+context was a pay per call campaign using several verticals like legal and real estate. We could target legal ads to maps, places and specific sites within our own network related to "Lawyers" in "Pittsburg". Very smooth case study with eCPMs of around $7. However, this number could not be scaled because the amount of inventory needed to match relevance against our entire network was huge. In fact, its feasible that even the largest aggregators today, would not have inventory to match all of our content. Even at our peak w/impression levels which were astonishingly high, the slicing and dicing of context and location could not work. It is still difficult to find. Most mobile aggregators and networks are just now launching or will launch their location based advertising initiatives. It is easy to count all ad inventory but drilling down to location and any associated metadata is very difficult, particularly within free form text of user-generated content. Early local advertising networks could match an advertiser to a pre-screened/pre-approved site, however, we were distributed across the web on about 500,000 sites per month and millions of blogs, profiles and websites. There were no APIs for controlling a subnetwork within their network. Mobile advertising and the emergence of powerful platforms like Apple and Facebook has made this partially irrelevant. Lots of apps are able to participate in systems that can and have scaled. With the power and brand of these platforms, it has created high advertiser demand, and a need for inventory on mobile devices and within social networks which require distributed models. We decided early on that we would not build up an ad sales force. We created a self serve ad platform but decided that the development and sale of this product would compete too heavily for resources creating our core map offering. The right answer is different for every company, but I still see lots of people throwing an ad network into their product mix before their product or platform is even solid or successful. It is not an easy task to build. Technically it is simple but there is a lot of legwork in the creation of a smooth running ecosystem at a scale that makes money for its participants. Between a maturing ecosystem, advertiser demand, mobile platforms and location-obsessiveness we have some good case studies for driving value and pricing. This is a question which is constantly changing and many of the networks are optimized around this today. Its amazing the range of perspectives in this world. Mypace disallowed us to link out from any widget, meaning as a developer, we could not monetize. Facebook on the other hand treats developers like a platform more than an ad network and believe its in their best interest to help developers monetize. Google has built its business on developer support and shared revenue, although, honestly the pay out on location and maps its still immature. So, in the old days, publishers were "inventory" for advertisers, I would avoid this mentality today where platforms are supporting shared revenue. Apple has the best history of helping its developers make money. I believe they will be able to extend this to advertising. I've averaged eCPMs over a period of time across various networks to give an overview and purposefully not drill down on a single network, ad type etc. Its a simple model for how many maps served and corresponding revenue that would yield at our avg eCPMs. Work only with third parties who get "platform" vs. "inventory"
Networks sell to "local" advertisers and create networks of publishers. At scale there is enough money moving through the system for publishers and networks to make money. We experimented a lot but there was not enough value in the fractions of context targeting and location targeting. Maps and distributed bits can be better monetized for better efficiency when we can have self serve platforms which are as much tools as networks. This enabled aggregators and map monetization potential. Maps, apps and distributed bits can be better monetized for better efficiency with self serve platforms which are as much tools as networks. But there is a missing piece. This is the piece Platial was so excited about from the beginning when we called our Platform "Support Local Business". That piece is A SINGLE UNIFIED COMMUNITY- not advertisers, publishers, developers, platforms. A single community where our roles change with our needs; the seller, the buyer, the marketer, the consumer, the business, the customer but always, a member of the community. Local advertising, allows us to cater to this and makes it a unique opportunity. To facilitate this you need a powerful exchange NOT a powerful ad network. Platial decided to cut out much of the inefficiency by creating "local self-serve networks". The opportunity is even greater with location-aware units as opposed to local targeting. We can track our exchange, our transaction, our value in better ways. An exchange can facilitate transactions or messages between members of a community. For example, I have bamboo and you can buy it--more like classified models, small businesses, independents. For this reason, I think Twitter may hold the key to the future of location-aware advertising. I have a special of the day and you are hungry, I have your friends here and you want to see them. Additionally, the economics work- it is cheap for me to buy a posting for $5.00 but expensive at a CPM if you rely on advertisers sending bulk messages. Twitter already facilitate supply and demand in a new way seamlessly between online and offline. They have created a dynamic potential marketplace, with real time need fulfillment-- Long tail of supply and demand as ad network. The big chains can only sustain so much of a network. So, here's to reducing friction, local economies, dynamic need fulfillment and greater transparency between buys and sellers. Good luck to everyone forging ahead on this! Good times and happy mapping. Just a few minutes ago, we pushed an update that signals the end of Platial as we know it. We are painfully aware that this is an incredibly short amount of time to dump this on people. The only response is a sincere apology. All other maps are available for anyone to export, as they have always been publicly accessible. Please pass the news around, we are unable to directly email the members, so are relying solely on word of mouth to get the news out. For those with Platial maps living on another site (widgets) we are sad to say that we have not found a comparable product that allows easy migration of your data at this time, but we would be more than happy to direct people to such a service if anyone out there can recommend one. Google's MyMaps on the other hand is compatible with the KML files we are exporting. If you want a place to keep your maps visible online, find the 'import' link after you create a new map. I hope this is enough information to get things started. Export more details about why this is happening in forthcoming posts. These export tools are applicable to any map on platial.com, so if you appreciate someone else's map, feel free to grab a copy (with the exception of a user places map (the map of all your places), in which case, it will only be available to that logged in user. Feedback is welcome as commentary here on the blog, on the getsatisfaction page, or via our feedback page. Shoppingcartography is a mapping activity that tracks where the things we buy are from. Intended for the home or workplace, this world map helps reveal the geography of our shopping in a fun and beautiful way. It is a kit that comes with a beautifully illustrated world map and color coding stickers. The act of continuously building up the layers on a map that is integrated into your daily life is pretty great. 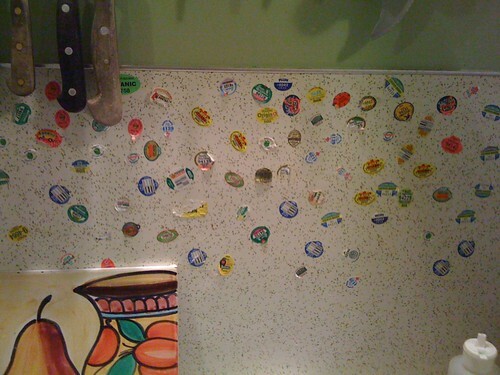 It also might be a nice way to get rid of those little produce stickers that just seem to accumulate everywhere. It would border on negligence to not share these cozy quilted map blankets from Haptic Lab (via @caterina). While being able to get behind their mnemonic impact (especially if allowed to annotate), there is something a little dangerous about wrapping a child in a soft version of a neighborhood: kindergarten turf wars. This morning we started sending email out to Frappr.com members about the imminent retirement of the "Classic" Frappr Guest Map. To clarify, the "New" Frappr Guest Maps, that we created 2 years ago, and offer up from Platial.com/frappr, are safe. If you are not sure which version you have, this should help. The backstory is that direct integration between frappr.com and platial.com could never get enough dedicated traction as it was never an emergency (oh startup life). A direct migration tool was under development and being tested but the lack of response from frappr power users basically killed the project. Many members cut their losses and just replaced their Classic maps with the updated New versions, leaving some significant amounts of data behind. We cut off the ability to create Classic maps about a year ago, but their use did not actually decline. We are still getting up to 500 new members a day through the 400,000 active widgets out there, but they just aren't sustainable cost-wise. A few days ago we released a KML export tool that can be used to back up all the friends and images onto your desktop. You are strongly encouraged to archive your maps. Today we are offering a new option for the truly loyal Frappr members, the ability to pay a small fee to keep ANY widget alive for the coming year. It doesn't have to be your own map, and you don't have to login to Frappr to initiate the payment. Just go to the map's homepage where you will see a huge yellow banner describing the process. The price is $24.99 and handled through PayPal (no account required here either, and yes you can pay with a major credit card). There is a payment deadline of Dec 31st, 2009. To: Jason Wilson, Frappr member since 2007. Two years ago Platial released an updated version of the Frappr Guest Map. Many Frappr members welcomed the change and replaced their old maps with the new ones. But many of you have not yet switched, in fact we still have more than 400,000 Classic Guest Maps still installed and active out in the world. The time has come to talk about your options as we start to retire the old version. 1. For those of you who are loyal to the classic style map, we are offering a simple payment option. $24.99 will keep your map alive and kicking for one full year. The deadline for receipt of payment will be January 1, 2010. At that time we will stop serving the maps. 2. For those who simply want to save their map data, we just released an export tool that gives you access to all the friends and photos from your maps creating a fully offline archive in the popular KML format right on your desktop. To use the exporter just look for the links on your map page on Frappr.com. More information about both options can be found right on the http://frappr.com homepage. Oh yeah, plenty of retro Frappr schwag still available. Today we are offering a new way to export and archive your "classic" Frappr maps for offline use. Classic Frappr maps are any maps that still talk directly to the frappr.com domain. After the locations and images are all zipped up (this may take a while for image heavy maps, or if the servers are under heavy load) your download should automatically start and you may be offered a choice to save the file or to open it with an application. These are fully self contained archives that can be shared or viewed offline. The classic Frappr maps have been superseded by a more robust and efficient guest map available directly from Platial. Many Frappr users have already upgraded, have you?